It’s become an MBIP tradition to get an ice cream treat at the Snacks ‘N Sodas restaurant once a year. For those of you that don’t know, Snacks ‘N Sodas has the recipes for all of the Hunt’s ice cream treats including the Orange Freeze, their milkshakes, hot fudge sundaes and Chocolate sodas and malts. Faith Hunt, who was the wife of the owner of Hunt’s, Gordon Hunt used to volunteer and she gave the ice cream recipes to the Proctor Snacks ‘N Sodas shop! So if you want a taste of Peoria’s sweet past, come here and get a chocolate malt, close your eyes and boom, you’re back at Hunt’s! In fact, here’s some vintage photos to get us in the mood for this week’s sweet drink! A little trip down memory lane via Farmington Road, plus an original Hunt’s menu I bought at Urban Artifacts. The Snacks ‘N Sodas shop is located in the Proctor Hospital. Just walk in the main entrance and when you step inside it will be right in front of you. I love the neon sign that’s blazing on the wall in here. As you can see there’s plenty of tables for comfortable seating or you can get your goodies to go. 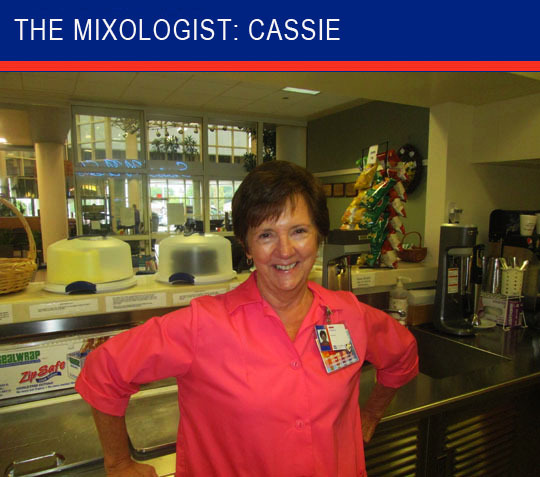 Cassie was forced...I mean she volunteered to be this week’s MBIP Mixologist. Cassie just started volunteering here and I appreciate her being a good sport and posing for photos! 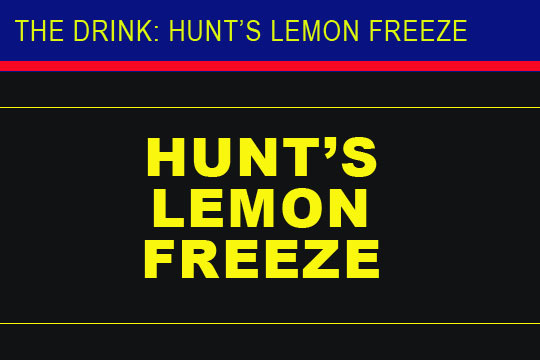 We decided on a Hunt’s Lemon Freeze, which is a variation on the popular Orange Freeze that they served at Hunt’s Drive-In. Even though Cassie is new here she’s making this drink like she’s been doing it her whole life! She’s adding fresh Prairie Farms vanilla ice cream, a splash of lemon soda among other ingredients and then it gets mixed up into a creamy and smooth ice cream drink. It looks fantastic. I’ve never had a lemon freeze drink and I’m anxious to try it! Ladies and gentlemen, I now give you this week’s MBIP Drink of the Week, The Hunt’s Lemon Freeze, skillfully crafted by Cassie! Cheers! It was delicious and I sucked in down in minutes and didn’t even get a brain-freeze! All the secret Hunt’s ice cream recipes donated by Ruth Hunt are hidden behind the counter. I’ve redacted them so you can’t steal them, not that you would, but this just kills the temptation! In addition to the Hunt’s ice cream treats, they also have cake and thumbprint cookies from Trefzger’s Bakery and Sweet Cakes by Rachael. And as you can see on the menu board they also have a nice selection of sandwiches, hot dogs, wraps and soup. A nice combination of sweet and savory in here! A bag of chips! Thanks to Cassie and all the nice women at Proctor Snacks ‘N Sodas for a delicious ice cream drink made from the original Hunt’s recipe! We’ll see you all tomorrow! Related Posts: MBIP Drink of the Week @: One World Cafe, Emack & Bolio’s and Mike’s Tavern.